Posted on 04/11/2017 by Mickey McCarter	in Interview, Live Review and tagged Black Cat, cuddlecore, Interview, Izakaya Seki, Japan, Naoko Yamano, Osaka, pop-punk, post-punk, ramen, Shonen Knife. Shonen Knife, Osaka’s reigning pop-punk trio, released their 20th studio album, Adventure, in 2016, and they have launched the 2017 USA Ramen Adventure Tour to play some more songs for us Americans. They play locally at Black Cat on Sunday, April 30. The 2017 USA Ramen Adventure Tour celebrates not only music but also Ramen. Frontwoman Naoko Yamano shared her personal favorite Ramen recipe in promoting the tour. She and her bandmates intend to sample Ramen from all over the United States while on the tour, and they have partnered with a Japanese restaurant in each city to promote their shows and local Japanese cuisine in each market. Parklife DC chatted via email with Naoko about Ramen and the state of her band after 36 busy years! Mickey McCarter: I see that you’re working with local Japanese restaurants to promote your shows and local Japanese cuisine in each market. Is there a partner Japanese restaurant in DC? In a related question, where do you find the best Ramen when you are in the United States? We would like some recommendations and some idea of how DC compares to other cities. Naoko Yamano: It’s Izakaya Seki (1117 V St. NW, DC, https://www.sekidc.com). It is the first time for me to visit there. I’m looking forward to eating tasty Japanese food in DC. I ate Ramen in the US several times. They are always tasty. I’ll search more tasty Ramen during this tour. Many people from all over the world come to DC for sightseeing or business. I searched Japanese restaurants in DC and found too many. DC has more Japanese restaurants than other cities. I want to visit many restaurants; I have only one stomach, though. MM: I’ve never been to Japan so I’m curious as to whether Ramen restaurants are different in any way there? Given that Ramen has become pretty popular in the United States lately, has our new generation of Ramen restaurants captured the spirit or are there subtle differences? NY: ‘Ramen’ is just one word but there are many different kinds of Ramen. For example about soup, there are pork-based, chicken-based, fish-based, or mixed. For noodles, there are thin, thick, straight, or curly. For flavors, there are salt, soy, miso… like that. Each restaurant has each recipe. It is the same with the US restaurants and Japanese but there are so many Ramen restaurant in Japan and it became more competitive. You can find many Ramen restaurants in one street in Japan. Ramen has a deep and complex flavor, and it’s handy to eat. Of course it’s tasty. That’s why Ramen has become popular in the US. MM: You have your own Healthy Simple Ramen recipe! Is there a story behind it? How did you settle on this recipe? NY: Professional Ramen recipe is difficult to make. It takes long time to make and needs various ingredients. My recipe is very simple. I often use Chinese soup stock powder for my cooking. It’s very tasty and useful. When I’m busy, I can make it quickly. The soup is not greasy and rather healthy. MM: Shonen Knife are a very prolific band — Adventure is your 20th album! You’ve also been touring every year. What’s inspiring your creative output recently? NY: It’s always difficult for me to write lyrics. Especially writing in English is very difficult since I’m not a native speaker. But it’s very easy to make music. I don’t know what’s inspiring me. I’m a very simple, easy person. I never look back and I can’t make a long future plan. I can’t analyze me by myself, but it might be a reason for my creative output. MM: It looks like you haven’t been to DC in a few years (although you’ve played in nearby cities). Have you missed us? This also means your new bandmates Naru Ishizuka and Risa Kawano have not performed here! What have you told them about DC? NY: I’m very happy to play in DC. Actually, Naru won’t come to the tour. Our bassist for this tour is my younger sister Atsuko, the original member. For our drummer Risa, it is the first time to come to DC. Atsuko and I’ve been to White House in November 2007 tour when we played in DC. I have a photo on my blog (http://www.shonenknife.net/blog/archives/3022). DC is a beautiful city and people there were so kind to us when we toured. I can’t wait to go there. We have only one day to stay in DC. I don’t know if we’ll have enough time to see the town, but I’d like to take Risa to see around the town. 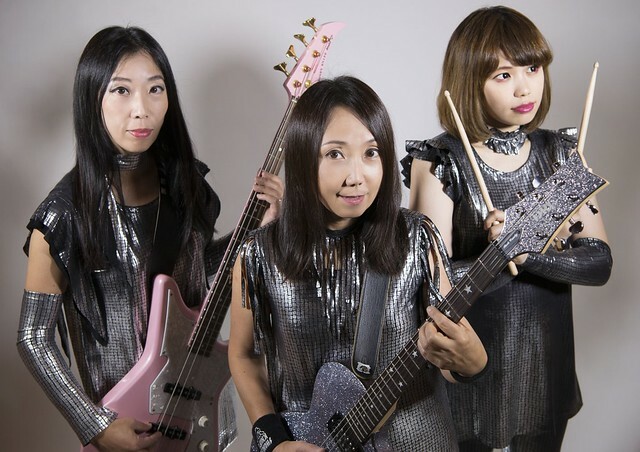 MM: After celebrating 35 years, what’s next for Shonen Knife? more albums? more tours? forever? NY: As I’ve said, I’m a simple and easy person. I can’t make a long future plan. I can say only one thing: I’m happy if our audience get happy through our music. If people need our music to be happy, I’d like to keep on rocking.